The articles I write have to do with project management. The document upon which I base much of my viewpoint is the Guide to Project Management Body of Knowledge, or PMBOK (pim-bok) for short. 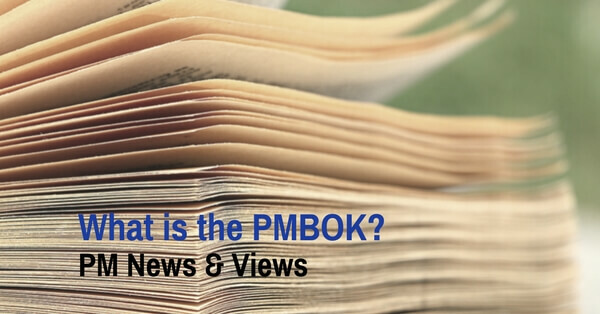 This article gives a short overview of the PMBOK. I hope you find it useful if you are preparing for your PMP exam, and maybe you will find it informative if you are not! The PMBOK is a document that basically describes how to manage projects well. This book has an appendix (annex) that describes the order of managing a project. However, the main part of the PMBOK is organized by knowledge areas and their related processes. You could think of a knowledge area as a topic. There are ten such topics that the PMBOK consists of: integration (putting it all together), scope, time, cost, quality, human resources, communications, risk, procurement and stakeholders. These are the areas we need to consider when managing a project. There is a chapter for each knowledge area. There are also forty-seven processes, with each process belonging to a process group. There are five process groups: initiating, planning, executing, monitoring and controlling, and closing. The process groups and processes represent what we, as project managers, do in a project. Each chapter lays out the processes that relate to the knowledge area, in order of process group. The processes discuss inputs, tools and techniques, and outputs. Examples of processes are: Develop Project Charter, Manage Project Team, and Identify Risks. I hope this description has been of use to you. For more information, you can purchase the PMBOK online (Amazon works well, or through pmi.org). You can also find the PMBOK in many bookstores.